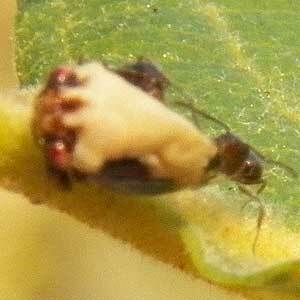 Arizona Naturalist >>> Sycamore Gallery Arthropods >>> Hemiptera >>> Vanduzea sp. This adult tree hopper is attended and guarded by many Liometopum ants on Arizona Sycamore (Platanus wrightii) in Devil's Canyon, Pinal Co., Arizona. 20 June 2012. Adult tree hoppers have a powerful pair of hind legs that can catapult them into the air, where upon a pair of wings unfolds from beneath the enlarged scutellum - a shield-like plate covering the back. The young, called nymphs. on the other hand are stationary and seldom move from their location. The reason they do not move is simple - their long piercing-sucking mouthparts are deeply embedded in the host plant's tissue drawing sap. Plant sap is sweet like soda pop, but not so nutritious. These bugs need to process lots and lots of it to gain sufficient proteins and minerals. Excess sugars therefore are a waste product that must be excreted. 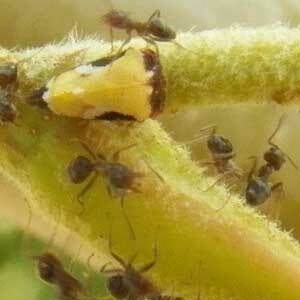 The ants that are almost always associated with established colonies of tree hoppers are there to gather honey dew and to protect this sugar resource from all harm. In so doing they also afford some protection to the tree itself by deterring caterpillars and other foliage feeders.